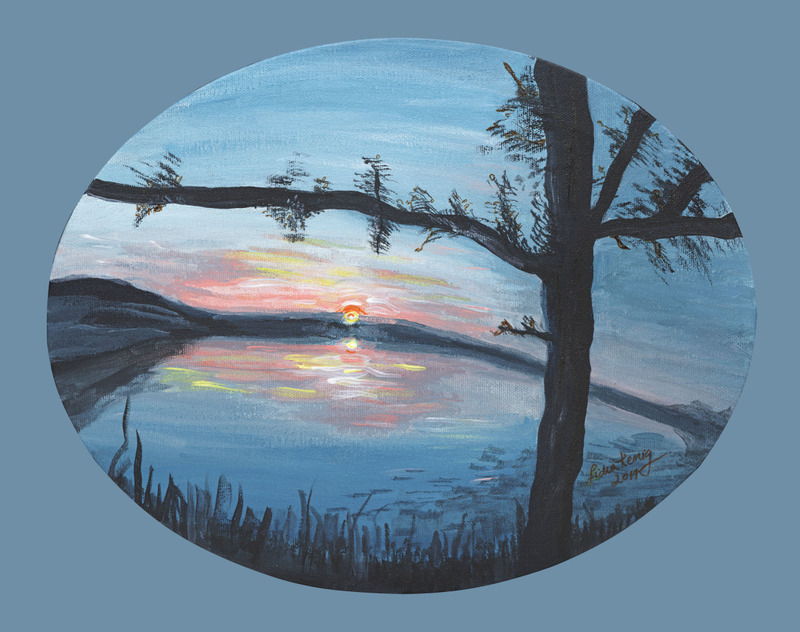 The image of a sunrise over a lake in Autumn was created as a Feng Shui adjustment to balance issues that dwellers of a home or office experience with their creativity and offspring. Health issues related to the mouth, teeth, throat, lungs and large intestines may also indicate imbalances in this physical area. In the art and science of Feng Shui, the living or working space mirrors the occupants' life. A weak Children/Creativity area will indicate weaknesses in the life of the people who live or work there. When this painting is installed in the room located on the middle right side quadrant of one's home or office, from the main entry to the space; it will heal the energy and broadcast balance, serenity and well being, no matter what the present conditons are. PLEASE CONTACT ME IF YOU NEED ASSISTANCE LOCATING THIS PARTICULAR ENERGY CENTER IN THE SPACE BEING CONSIDERED.